Home > Reaching out to your readers? Print! Reaching out to your readers? Print! Despite the fact that laptops, tablets and smartphones are commonplace these days, a lot of users of your product(s) are still not on the World Wide Web. If this is the case with your audience, a printed manual still is a very good option. Looking for a printed manual? Or a series of simular manuals, each in multiple languages? We can help you. In some countries, even developed ones, the market penetration for Internet connections does not surpass 30%. This leads to the obvious conclusion that no manufacturer can leave printed manuals out of the picture. After all, European directives state that each and every user should be able to get hold of information on your product. This includes all users who aren’t online yet. However, you need not solely rely on printed versions of your manual(s). Why not reduce printing costs and give you a far better opportunity to update your information at the same time? To be more precise: we can help you setting up a quick start guide on paper and publish the rest of your technical documentation online. This way, your reader has all the information at arm’s length to use your product safely, on paper and online. At the same time, you comply with European regulations. To make this all possible, Manualise is using special software. With MadCap Flare, we can create any new online channel for your centrally saved content. But we can also publish your printed information in any format, such as A4 and A5. When you would opt for both print and online, the responsive design technology of our software will automatically adjust the layout of your information to its relevant device, whether this would be a desktop, laptop, smartphone or a tablet. 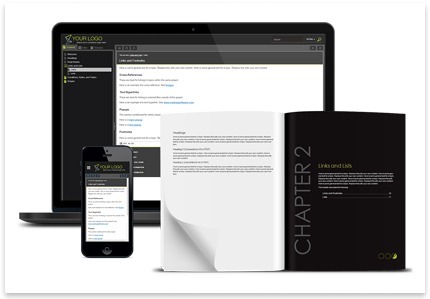 Are you interested in publishing a printed manual or multiple printed versions of your manual in multiple languages? Are you looking for cost effective ways to write your technical documentation?